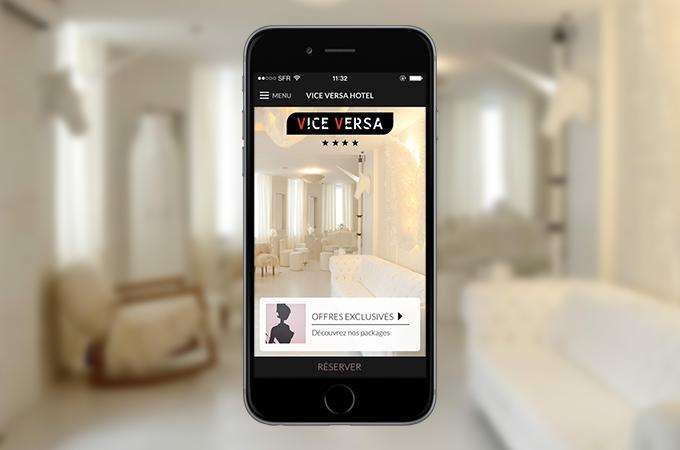 Now you can keep in touch with the Vice Versa Hotel from anywhere. Wherever you are, whatever you’re doing, our apps for your smartphone, iPhone or iPad allow you to book rooms or use our shop service to enhance your stay. The Vice Versa is an elegant and luxurious boutique hotel in the heart of Paris. Decorated throughout by acclaimed artist and designer Chantal Thomass, the hotel is a haven of calm and refinement. Why not take a closer look by downloading one of our apps which have been created for use with your phone or tablet? You can explore the hotel’s beautiful rooms and public spaces with our easy to use apps, or use them to book a room and add extras such as breakfast delivered to your room in the morning. How about a fabulous Omnisen’s massage oil and steam kit for those wellness moments, or a sensual Love Box complete with a heart of fresh rose petals for a romantic break? The hotel has a range of extra services that can be accessed in person or with the app. After a busy day, what could be nicer than fine St. Emilon or Pomerol red wines to enjoy in your room, or a bottle of sparkling chilled champagne? Our Honesty Bar is also a great place to spend a relaxing evening, and Happy Hour is from 18.00 to 12.00. One of our best loved extras is surely our elegant black umbrella. In case of inclement weather, just ask at reception, or use your app to book from your room while you’re enjoying your next stay with us at the Vice Versa Hotel.